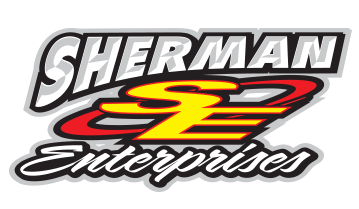 Todd Sherman is the owner and operator of Sherman Enterprises which is located just south of Merriam, Indiana at the intersection of 9 and 33. After racing circle track cars since 1986, Todd officially went into business full time for himself in 2000. As a driver Todd has had an illustrious career. He has won approximately 200 feature races, along with numerous track championships in his 30+ years of racing. As a car builder and fabricator, he has built, fixed, and repaired hundred of cars helping other racers and customers get back on the track and get into the winners circle. Todd wanted to use the knowledge and experience he gained as a third generation race car driver to help other racers and do what he loved to do. After having a good career driving cars, building and repairing them, and selling race car parts Todd decided he wanted to do more. Todd and his son Brennan decided to expand the business in 2016 to include a website with a fully stocked online store. We plan to take the expertise that we have in racing, and help you get the parts and advice that you need to go win races, or become a better competitor when you are at the track. Our online store has approximately 80,000 items that are in stock and ready to ship. Along with the items we stock for circle track cars, we have items for hot rods, late model muscle cars, as well as for off road trucks. Thanks for visiting and feel free to send an email or give us a call if you have any questions.